In his quest to shed his childhood nickname 'chubs,' Justin encountered a few obstacles and expelled a lot of effort running and lifting weights. Justin set his sights on his serious weight loss goals. He made some big changes in his lifestyle and came out 82 pounds lighter. 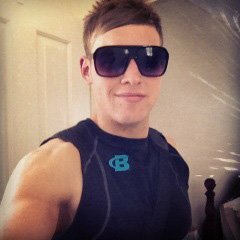 He continues to strive for perfection, hoping one day to hit the fitness competition stage and make his father proud! I had been fat for as long as I could remember. I grew up with thin friends and everyone in my family was thinner than me as well, but I just loved food. My close family, and especially my mother, tried to get me to diet, but I hated them all. I didn't like that everything I wanted or loved to eat was banned. I had to sneak around, which eventually made my eating habits worse. I was teased a lot in school. My nickname became Chubs and I eventually learned to live with it. I still hear it to this day. I never had a girlfriend and felt like no one was interested in me. I felt disgusting and my confidence was low. But, I didn't think there was much I could do about it. I played as many sports as I could at school and always tried my best, but I had trouble keeping up with the fit kids. My self-esteem worsened when we all started to go out partying and clubbing. I could see all my friends having a good time dancing with girls; I didn't feel as though I fit in properly. I couldn't buy all the nice clothes everyone wore. I'd go to shops and see shirts and pants I liked, but they were smalls and mediums and I needed an extra-large or double extra-large. It was embarrassing. I rarely bought anything new because I hated that clothes didn't fit me properly. My weight also kept me from scoring jobs I wanted. I was trying to become a carpenter, but I kept getting overlooked. I think employers thought a fitter guy would work harder. I knew there was no benefit to being overweight. Something had to change. I watched my friend lose about 11 pounds (5 kg). His success got me thinking I could lose weight too. So, I asked him what he was doing for fitness. He would run every day and only eat three smaller meals throughout the day. I started training with him and the weight started falling off. Every week I dropped more weight. I set small goals for myself along the way, but my major goal was getting out of the double digits. I remember the day when I hopped on the scale and it said 218 pounds (99 kg). I was ecstatic! I was going to the gym twice each day, once at noon for a 5K run and then again at around 5 or 6 p.m. for weight training. I was worn out every day, but the results were worth it. I got down to 194 pounds (88 kg) and hit a plateau. 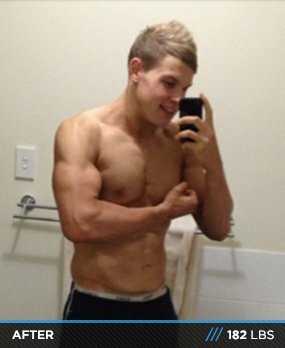 At the time, I had no idea what a plateau was or how to get past it, but I found out on Bodybuilding.com, I learned how to train and eat like a bodybuilder. I also I thought I could try a supplement for fat loss. 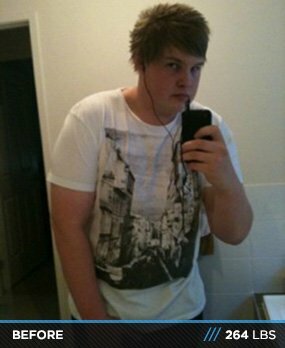 Before I knew it, I was on my way to my final goal of 176 pounds (80 kg). I had visible abs and was amazed at my results. In 6 months, I lost 88 pounds (40 kg)! I've been so happy with my results, but the dramatic weight loss has resulted in some loose skin. Everyone tells me that it isn't a big deal, but to me it is. I want to look incredible and be able to start a career in fitness modeling or even competing. I feel like my excess skin holds me back. I read that if I bulked up a bit I could fill in the skin with more muscle, but when I attempted to add muscle, I felt like I was getting fat again and didn't want that. I knew my only good choice was to have surgery. 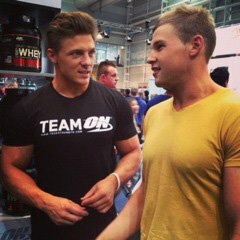 My idol is Steve Cook. I watch all of his training videos and listen to all his advice which motivates me to do better. One thing he said is to set long-term goals. Writing it down instead of just thinking about it helps and pushes me to get things done. My motivation comes from my friends and family. Although my friends didn't realize it, every time someone said, "Wow you've lost a lot of weight!" gave me a massive confidence boost. I loved that everyone noticed my hard work and dedication to new lifestyle. Throughout my journey, I have always had my father and mother pushing me to do better and work harder. They loved to see me lose weight and be happy. Unfortunately, my dad had been battling cancer for around a year and passed away in March last year. It has been the hardest thing in my life. I'll never forget him. I try to stay positive and see it as more motivation. It has made me stronger today. I know he wants me to be happy and see me succeed in life, which is why I now dedicate my life to bodybuilding and helping others to stay healthy. All my supplements are made by Optimum Nutrition. Their protein tastes phenomenal! My diet is a 40/40/20 (protein, carbs, fat) split. I eat 1.3 grams of protein per pound of bodyweight per day, and 20 percent of my total calories are fat. I eat most of my carbs for breakfast and before and after a workout. I also strive to have 40 grams of fiber per day while limiting myself to no more than 50 grams of sugar. When I get cravings I beat them with low-fat, low-sugar yogurt. It keeps me from eating a lot of high-sugar junk foods. I track my calories every day using the myfitnesspal app. I couldn't live without it! The following diet totals 2,450 calories. I usually stick to the 8-12 rep range. But, I like to keep the weight heavy. If I hit 12 reps, then I add more weight until I struggle to get 8 reps. I keep my rest time at one minute, so my workouts are quick and intense to burn more fat. Before each workout, I do 10 minutes of cardio to warm up and then I do some active/dynamic stretching of the muscle group I plan to work out. Progress cannot always be seen, but stick to it and you will see those results. Even when you have a bad day at the gym, get on with your day and don't let it get you down. A good diet is essential. Most problems with weight loss or muscle gains are related to a poor diet. Track calories! It's easier than you think—especially with free apps and BodySpace. The information you get from tracking your calories can help you figure out what you're doing right and what you need to work on. In Australia, most people my age experience a lot of pressure to look good. The lifestyle is all about the beach and the clubbing/festival scene. Because so many want to be healthy and fit, it's pretty easy to get workout tips and help.